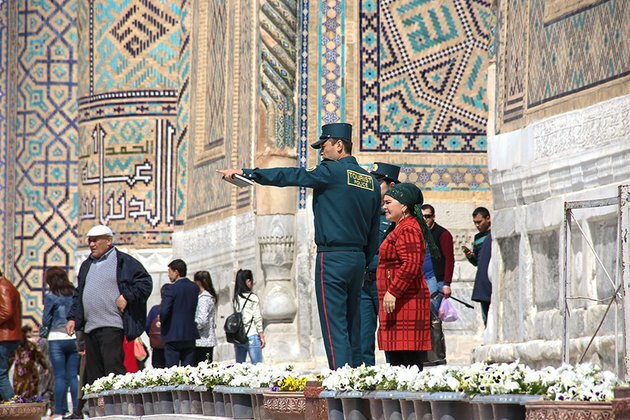 Authorities in Uzbekistan have sent an ethnic Kazakh man with Chinese nationality back to Thailand in spite of Beijing's attempts to have him repatriated, RFA has learned. Businessman Qalymbek Shahman, 41, initially fled China, which has incarcerated an estimated one million or more ethnic minority Muslim Uyghurs and Kazakhs in "re-education" camps, on Jan. 4, arriving in Thailand, where he took a flight to Almaty in Kazakhstan. He then boarded a flight to Uzbekistan's Tashkent airport after being denied entry by the Kazakh authorities, where he was stranded while Chinese officials tried to claim him and take him back to China. The repatriation bid failed, however, and Uzbek authorities put Qalymbek aboard a flight to Thailand, his port of origin, on Saturday. An unnamed source told RFA that Qalymbek was dragged onto the plane to Bangkok by Uzbek police. "Someone had tampered with the power sockets while he was in the airport in Uzbekistan, so he could recharge his phone," the source said. "They dragged him aboard the plane to Thailand, and he got into a struggle with the Uzbek police, during which he self-harmed once again." "I hear that he was taken to a hospital when he got to Bangkok," the source said. "His phone has been working but he's not picking up." "His phone would have been switched off if he was being repatriated by the Chinese," he said. Qalymbek's nephew, Qarbai Yelan, called on the United Nations to grant his uncle political refugee status. "I asked the Thai government and the U.N. to grant political asylum to my uncle Qalymbek," Qarbai said. "Please don't send him back to China." However, Thailand isn't a signatory to the Geneva Convention on refugees, and the Thai authorities have previously repatriated Chinese nationals recognized by UNHCR as genuine refugees, presumably at Beijing's request. Qalymbek had been trying to visit his sister in Kazakhstan when he was denied entry, he said in a video message sent from Tashkent last week. "I was born in Emin (in Uyghur, Dorbiljin) county in China's Xinjiang Uyghur Autonomous Region (XUAR), to a farming family," Qalymbek says in the video clip, referring to an area of the XUAR's Tarbaghatay (in Chinese, Tacheng) prefecture. "I wanted to go to Kazakhstan, because China's human rights record was making life intolerable." "I would have my ID checked every 50 to 100 meters (164 to 328 feet) when I was in Xinjiang," he said. "This made me extremely anxious, and I couldn't stand it anymore." He goes on to explain that he is a businessman who often accompanied foreign clients on tours around China, but that he was routinely humiliated by ethnic profiling at every turn. "Whether it was getting on a plane, on a train or other public transportation, they would spend half an hour checking me out every time," he said in the video message. "When my clients from Russia and Kazakhstan would come and visit, the security guards would check my ID in front of them." "My clients would ask me why, and I said it was the [government's] problem, [but] gradually my clients all stopped coming," he said. "The local factory owners would have nothing to do with me. They didn't want to work with me any more." Last year, Qalymbek moved to live in the southern Chinese city of Guangzhou, along with his Han Chinese wife and the couple's young son. Although Beijing initially denied the existence of re-education camps, Shohrat Zakir, chairman of the XUAR, told Chinas official Xinhua news agency in October 2018 that the facilities are an effective tool to protect the country from terrorism and provide vocational training for Uyghurs. Reporting by RFAs Uyghur Service and other media organizations, however, has shown that those in the camps are detained against their will and subjected to political indoctrination, routinely face rough treatment at the hands of their overseers, and endure poor diets and unhygienic conditions in the often overcrowded facilities. Adrian Zenz, a lecturer in social research methods at the Germany-based European School of Culture and Theology, has said that some 1.1 million people are or have been detained in the campsequating to 10 percent to 11 percent of the adult Muslim population of the XUAR. Citing credible reports, U.S. lawmakers Marco Rubio and Chris Smith, who head the bipartisan Congressional-Executive Commission on China, recently called the situation in the XUAR "the largest mass incarceration of a minority population in the world today."